Well this is kind of fun; recently being the end of the year I was going through and checking out all the posts I’ve made on TAY over the past year since I’ve got authorship. Interestingly the first post I ever wrote was actually an accident (as I didn’t know I had authorship...) and it was for the fourth Promo to Akito the Exiled. So I thought hey lets keep this tradition going a show the final promo for this interesting if not amazing OVA series. 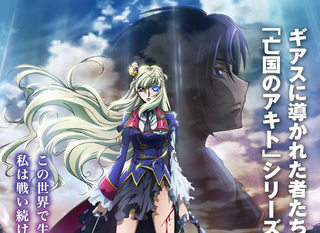 Akito the Exiled is a side story of the original series set in between the events of S1 and R2 however over the course of the series more and more characters from the original series have made their appearance. This has however really only served to mud up the timeline a little bit, here is hoping Episode Five can stick the landing. However if you’re fans of the series I suggest checking out the whole thing when this releases on Feb. 6th it’s a fun ride.